Serhiy Hayduk was earlier accused of sabotaging naval reform. 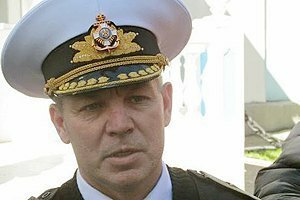 President Petro Poroshenko has dismissed Serhiy Hayduk as Ukrainian Navy commander. The decree to this effect was published on the president's website. In February, Hayduk found himself in the middle of the scandal after volunteers helping the fleet accused him of sabotaging the Navy's reform in line with NATO standards. Read more about this in volunteer Olha Reshetylova's article A Brussels "surprise", or why the Navy Command is not excited about NATO-proposed reform. On 1 April, the Odesa website Dumskaya quoted its sources in the General Staff as saying that Poroshenko had replaced Serhiy Hayduk with Ihor Voronchenko as Navy commander. The Navy press service denied the reports then.